Day 19: Saruya - Monkeys in the Woods - Kampai! : Kampai! After a relaxing weekend, I was up at 6am to wash the imo as usual. My times have gotten better. I can now reliably get through a wash in about 2:10 – 90 seconds for the wash and 40 seconds for the transition. I’ve now pushed my best time down to 32 seconds for the transition. I’ve realized those few seconds from each load really add up when you’re washing nearly a metric ton of potatoes – 32 to 33 baskets worth. After that it’s time to stir the second moromi – 60 strokes in each pot and about 15 minutes for the first day’s new second moromi, which is still sitting in a large steel tank next to the imo steamer. 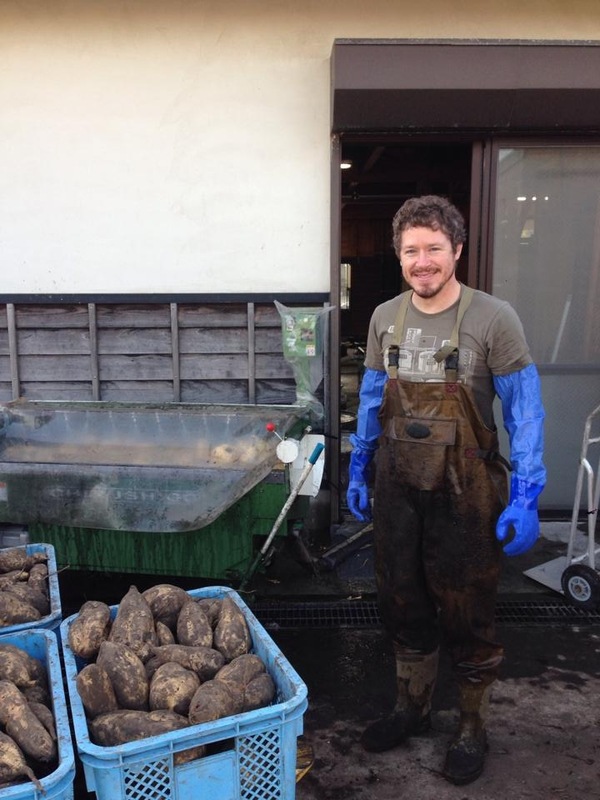 This is the hardest mixing, because the potatoes are still largely solid – by the time the second moromi gets to the end of its fermentation cycle, it’ll be largely liquid. The work is becoming more routine now as my body gets used to the motions and my muscles have moved beyond soreness to simple fatigue. Short rests and lots of fluids helps keep me refreshed. It’s really a different mindset from intellectual labor. At the end of a day at the office my brain will be tired, but my body will be antsy, ready to do something – anything. With this manual work my body is exhausted, but my mind is ready for action. Today is not too difficult, because there is no sleeping koji since yesterday was a holiday for the distillery. As such there will not be a new first moromi tomorrow and in a week there will not be a new second moromi. Each time the distillery takes a holiday during the shochu making season they lose approximately 720L of shochu, which works to several thousand dollars in revenue so it’s a big decision not to open for a day. With the lighter work schedule we’re able to finish about 7pm after which Tekkan-san decides to give his wife a break from cooking for us and we head out for maguro ramen. Now for those of you who know me, whenever someone asks about my favorite ramen, I always reply, “In NYC I love Hide Chan, but maguro ramen …” after which I trail off into reminiscing about this amazingly delicious bowl of soup that I’d only had one time. It turns out maguro (tuna) ramen is unique to Ichikikushikino, Kagoshima. In 2005, the city of Kushikino merged with the town of Ichiki (where Yamato Zakura Shuzo is located) to create the government entity, Ichikikushikino. In order to differentiate this new entity from other municipalities in the area, the mayor decided to take advantage of the bounty of the Kushikino port, which is a deep sea port bringing tuna back from the Pacific. 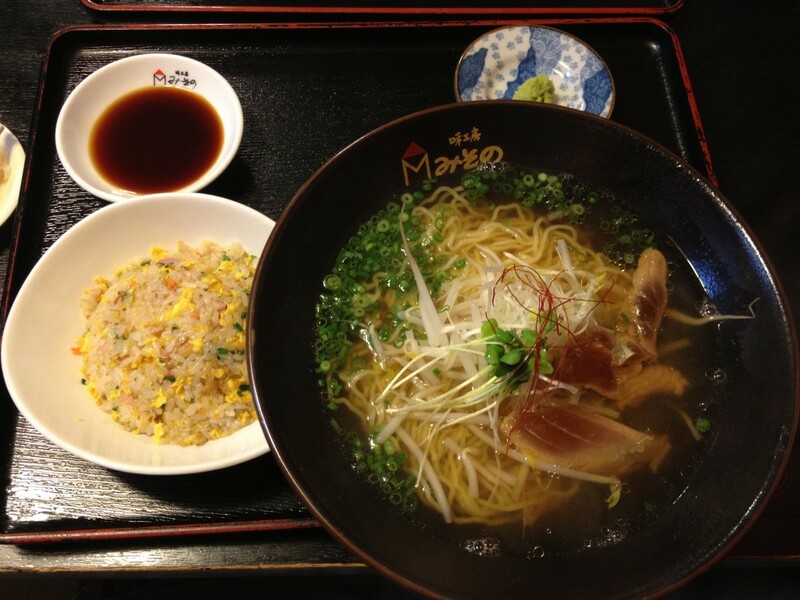 Maguro ramen is one of several such local dishes that were created by government decree, but it is by far the most popular among locals. I can’t speak to the others as I never tried the maguro katsu (fried maguro cutlet) or other dishes that are now local to Ichikikushikino. Unfortunately, it was a Monday night so many shops are closed. 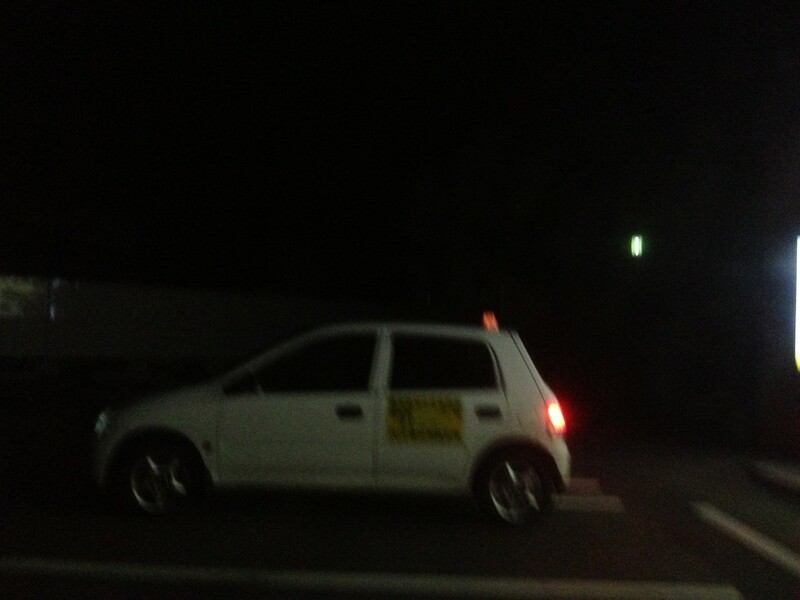 Tekkan-san drove us to his favorite ramen shop, which was closed. As was the second. We finally found a third that was open. As we were parking we spotted the toji from Tengu Sakura Shuzo – a famous shochu distillery in Ichiki, a short walk from Yamato Zakura. Tekkan-san had been trying to figure out how to introduce me to this toji without being impolite. This was our opportunity. Things like this kept happening throughout my trip – good fortune that had no business happening, but did, over and over and over again. The toji was having dinner with his wife so we took our table near the front door so he’d see us on his way out. But that’s getting ahead of the story. The maguro ramen was as good as I remember, only this time it was served with gyoza and fried rice in a set. Way too much food, but way too delicious. The ramen was as good as I remember even though this was the 3rd option in Tekkan-san’s mind. This got me excited to try the other two, but I’m not sure I’ll have time before I leave. The 3 or 4 slices of maguro, which is sashimi at the time it’s served, cooks quickly in the piping hot broth, so you have to eat it before it gets well done. As such, it disappeared from my bowl way too fast so I ordered another helping. They were shocked. Nobody had ever done that before, but everyone agreed it was a great idea. Full and happy, the Tengu Sakura toji finished his meal and stopped by our table. He was very pleased to meet me and would be honored if I visited his distillery. The visit is scheduled for Wednesday. I order another beer to wash away the maguro oils lingering on my palate when Tekkan-san explains that we need to go – we’re meeting a friend of his from high school for a trek out to a legendary place in Satsuma-Sendai. To say that Saruya (“monkey house”) is in Satsuma-Sendai is kind of like saying that Staten Island is in New York City. Technically it is, but only technically. Driving down a dark country road surrounded by thick old forest we come upon a small parking lot in front of a windowless building decorated with shochu bottles and a neon sign. This was our destination. There’s not another building in sight. 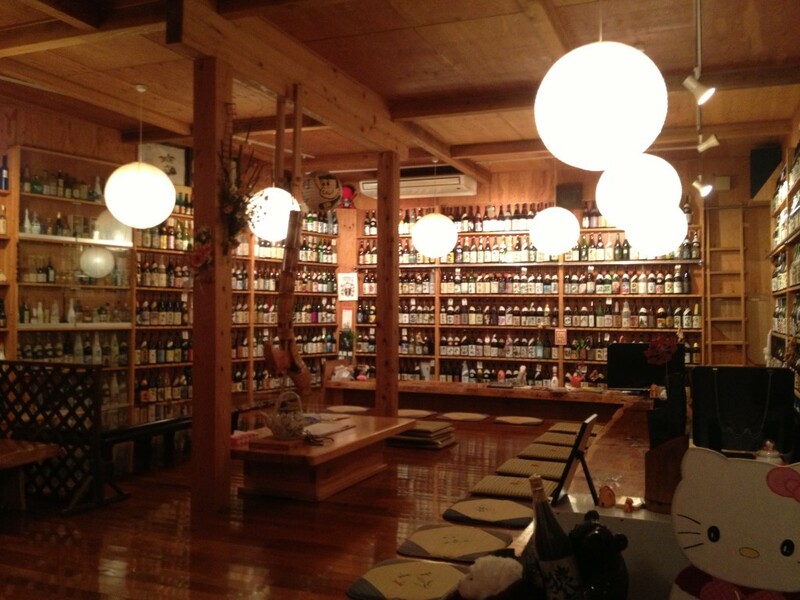 Stepping inside you enter a temple of shochu. Saruya has more than 1,000 1.8L bottles line 2 1/2 of the 4 walls. The other 1 1/2 walls is lined with 300 to 900 ml bottles. More than 1,000 1.8L bottles of shochu likely represents the largest private collection in the world. We are the only customers there on a Monday night. The owner is a quiet, older gentleman. He offers us seats at the bar, which is tatami style – the bar is low at your waist while the proprietor stands at ground level, below you. It’s a different feeling than what I’m used to, but I like it quite a bit. I’m mesmerized by the selection, but when I ask for a recommendation the owner demurs. He doesn’t drink shochu very often and he would certainly not be comfortable making a recommendation to a shochu lover like myself. Through Tekkan-san’s classmate, who works for the local government and speaks excellent English with a faintly Australian accent, I discover that the owner began his collection after seeing an airplane bottle collection of a friend of his. He decided to collect i-shobin, the traditional 1.8 L bottles that are used for sake and shochu sales in Japan. When he retired from his office job his first project was to build a display case for his shochu. 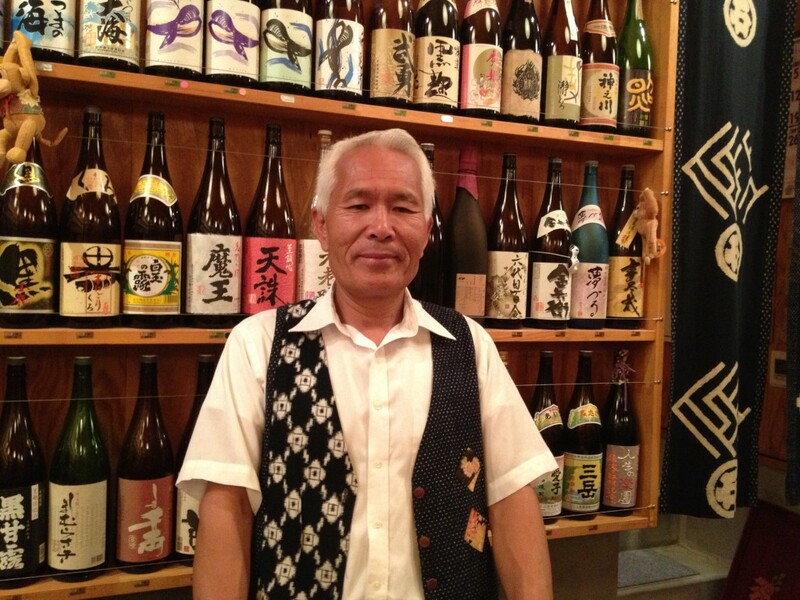 He realized he could not build a large enough case in his home, so naturally he opened a shochu bar and Saruya was born. 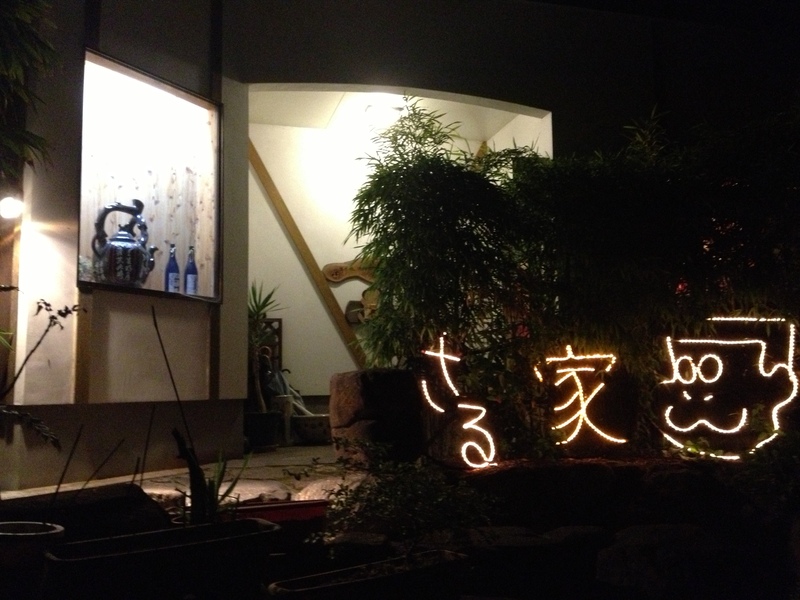 Saruya has quickly become a legendary bar in Kagoshima Prefecture and a destination for shochu otaku throughout Japan. On the wall are photos of famous people from around Japan. When he realized who Tekkan-san was and why I was there, he snapped our photo to put on the wall as well. I returned the favor so here he is on my blog. After trying one particular shochu I explained to Tekkan-san that I’d tasted a number of imo shochu with this flavor and aroma and consistently did not enjoy them – which is odd since I love most imo shcohu. After smelling and tasting he explained the reason for the aroma and flavor – rotten potatoes. Apparently some shochu brands have gained a loyal following by making shochu from imo that have turned a bit. The acrid sickly sweet flavor the rot imparts is apparently popular with some drinkers. Not me. Unfortunately, there is no way to know which shochus have this flavor until you try it. The nose can deceive. Fortunately, none of these shochus make it to the US. Tekkan-san was surprised I could distinguish this aspect, but when you drink as much shochu as I do I guess you develop a sensitivity. At the end of the evening we had a dilemma. We’d all been drinking, but Tekkan-san had driven. Japan has a zero tolerance law for drinking and driving (something I completely support) so driving home was not an option. If he were caught drinking and driving as a distiller, his distillery would close. The government would shut him down. Can you imagine a similar response in the US if the president of Jack Daniels were pulled over for DUI? Me either. Fortunately in Japan they’ve adapted to this and a local taxi company will bring two drivers. One to drive you home in your own vehicle and the other to follow behind and take the auxiliary driver home. Called “daiko”, this is an absolutely brilliant solution to a common problem – and something I’d love to see us adopt stateside. The driver even stopped by the convenience store on the way home so Tekkan-san could get cash and milk. Your work outfit, the shochu palace, and daiko are all fucken baddeasse! Yoroshiku Senman Arubeshi (aka, Hakkaisan Sannen Chozo) is a moromi shochu produced by Hakkaisan, one of the most popular sake brands in the U.S. This particular shochu is distilled from raw sake mash (moromi). The only difference between this shochu and one of Hakkaisan’s famous sakes is that it’s distilled instead of brewed. In the US, Satoh Kuro is simply known as “Satoh” as none of the distillery’s other product lines reach our shores. In Japan, their national premium labels are Satoh Kuro (black koji sweet potato, Satoh Shiro (white koji sweet potato), and Satoh Mugi (barley). All are delicious, but only Kuro comes Stateside. 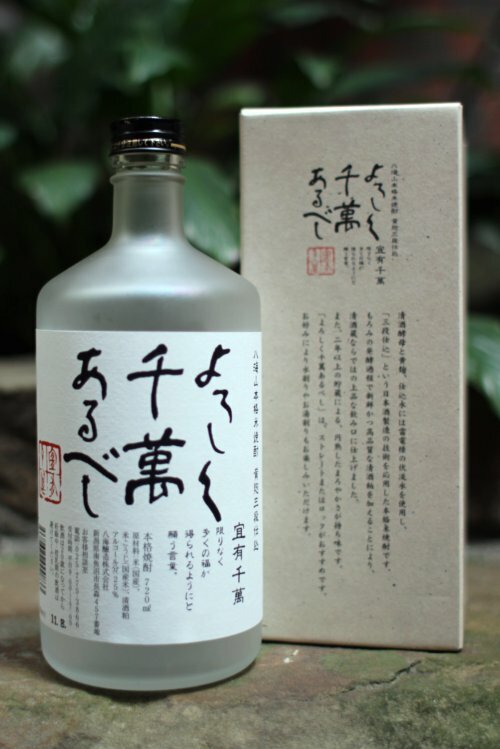 Mizunomai (Mizu for short) is a high proof barley shochu that was developed for the global market. Extensive taste testing with customers and bartenders throughout Japan, the US, and other Asian countries yielded this blend as the most popular all without compromising the artisinal qualities that make this class of spirits so unique. Yamanomori is as old school as they come among shochus imported to the U.S. Made using the traditional atmospheric (unpressurized) pot still, black koji to impart a rich earthy undertone, little if any filtration, and the very traditional 2:1 ratio of barley to rice, Yamanomori is a taste from the past. 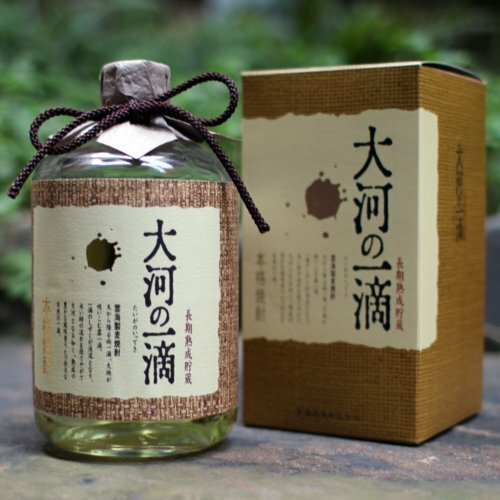 Much richer, bolder, and more exotic than most any other barley shochu that comes to our shores, Yamanomori is unapologetically an “old man’s” (oji-san) shochu. Daigano Ideki is our best guess for an English spelling of the name, which means “one drop in a big river.” Finding information on this shochu is very much like one drop in a river. There’s virtually nothing reliable out there. What we do know is that this barley shochu is aged in oak barrels stored in a cool dry place.